There is never a dull moment when it comes to the internet. You can find practically anything you want, whenever you want it. To make that process even smoother and more direct, companies have created a bunch of apps designed to help you find what you're looking for, or enlighten you on a subject you may not have even thought of yourself. Here are some of the best discovery and wonder apps available in Windows Store right now. Salman Khan, a graduate of MIT and Harvard Business School, started Khan Academy after noticing that the YouTube math tutorials he made for one of his nieces was getting thousands of page views. His channel and the website he created have become so successful it was a no-brainer to create a Windows 8 application. Khan Academy is a great resource for free lessons on just about any subject. You can find tips on adding mixed numbers, learn how the U.S. treasury makes decisions on financial intervention, or get a bunch of guides and tutorials for those graduate school exams. 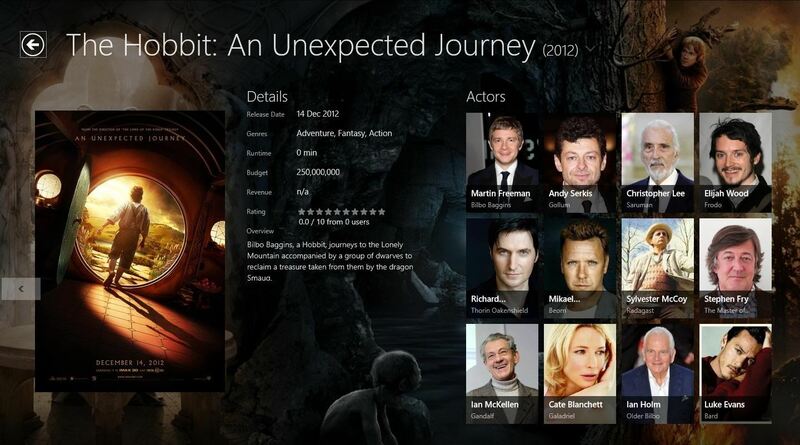 It's by far one of the most expansive and impressive discovery apps in the Windows Store. Need more convincing? 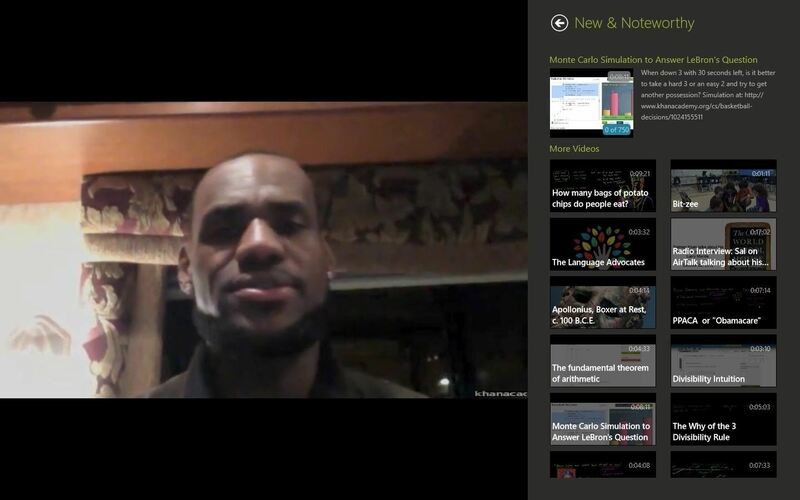 Even Lebron James uses it. Searching for flights and traveling in general can be a pretty stressful undertaking. Airlines offer drastically different prices for the same flight and wonky routes on top of that. In order to save yourself a bunch of time, instead of looking at each airline's individual website, Kayak lets you compare flights and pricing options in a nice, single source. 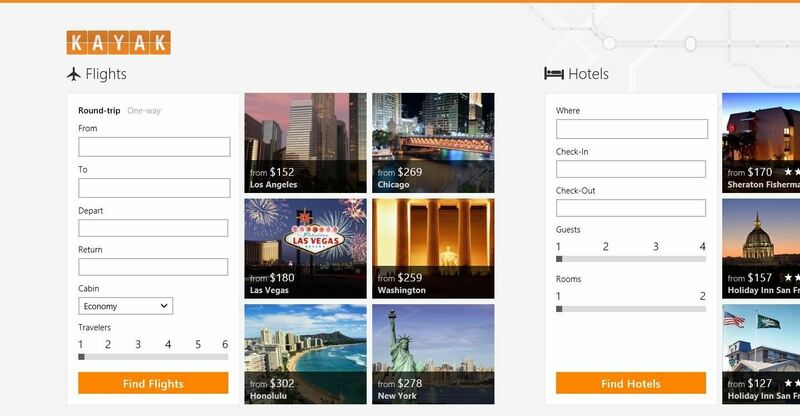 The interface is very sleek and easy to navigate and the site also provides information on hotels and rental cars for all of your travel needs. You'll not only be able to discover a bunch of trips and great hotels, but you will also see how easy and affordable that trip can be with this all-in-one travel app. 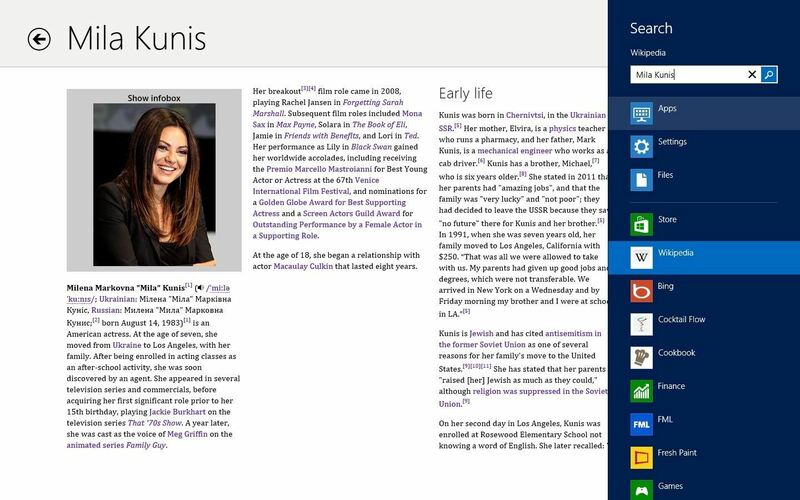 Undoubtedly one of the most popular websites on the internet, Wikipedia comes to the Windows 8 Store with a sleeker look and, as always, a thorough database of information. 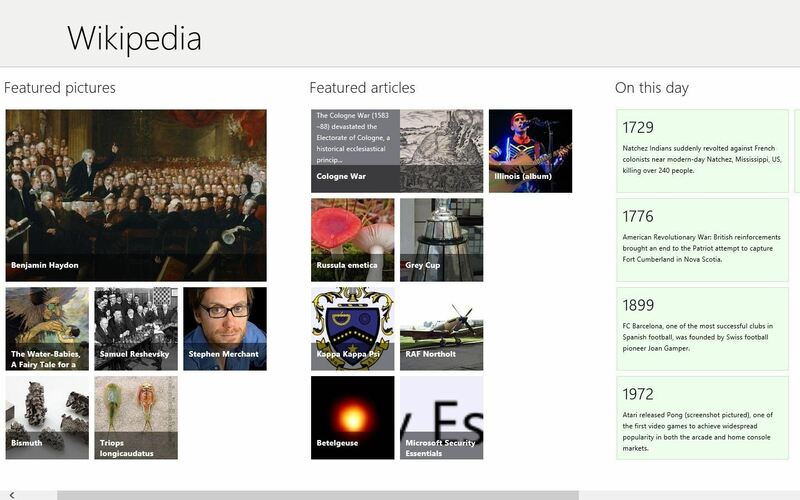 Unlike the Wikipedia website, the app's home page provides users with a bunch of topics in sleek looking tiles. 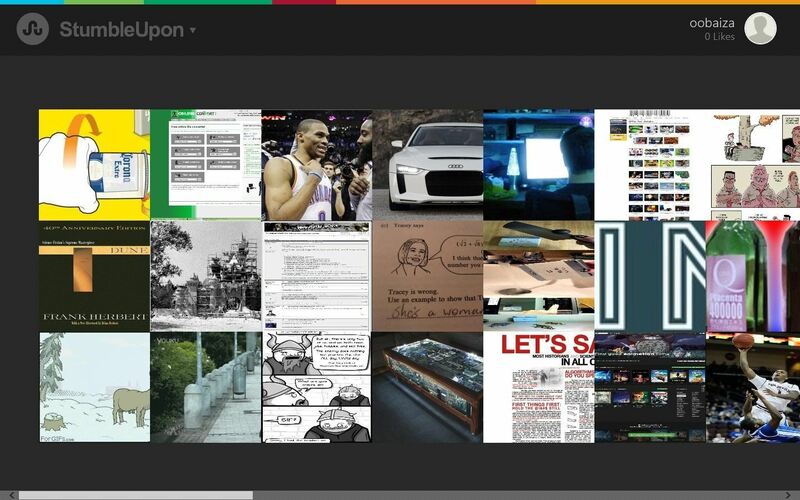 This new tiles layout urges users to click and discover new things. One of my favorite features is the "On this Day" section where you can find out interesting things that happened in history on the same date. Wikipedia is pretty much the definition of a discovery application and it never fails to inform me about something I didn't know before using it. If you want to search for a particular thing or person, like my future wife Mila Kunis, then all you have to do is start typing from anywhere inside the app to bring up the search menu. The app is extremely easy to use, and can provide hours upon hours of information and interesting facts. Another internet tool ported to the Windows Store. StumbleUpon has been my tool of choice for procrastination for a few years now. While the other apps I've mentioned are usually for searching for something in particular, StumbleUpon thrives on randomness, and isn't that what discovery is really all about? Like with many of the websites that created their own Windows 8 apps, the overall look and feel is upgraded and the interface is much more pleasing to the eye. Simply click on any of those article tiles and you can begin Stumbling. In a matter of minutes I found some pretty legitimate things. 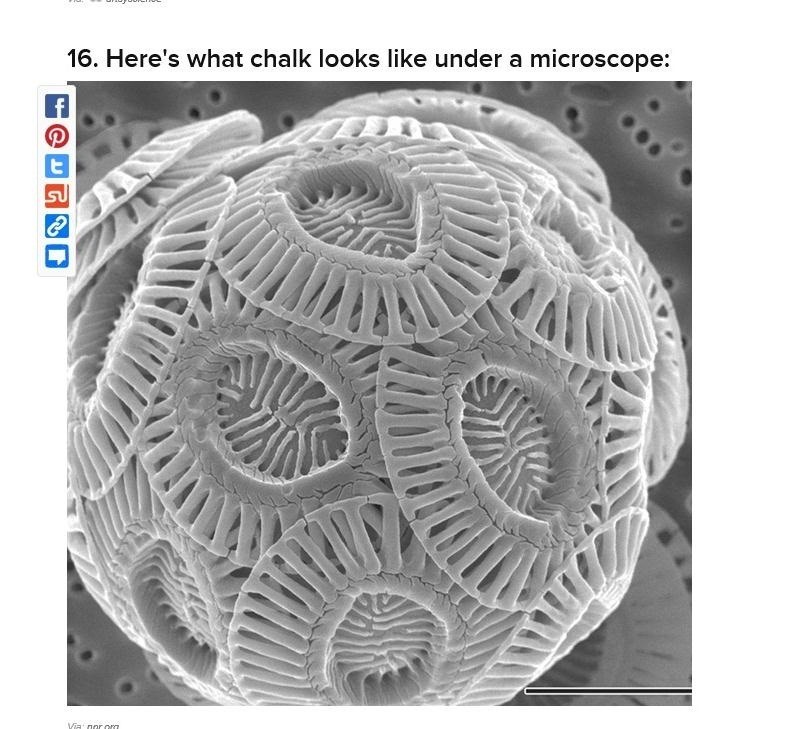 There no way I would have ever known what chalk looks like under a microscope, or even thought to look for it, but StumbleUpon just takes you on a journey of randomness, which can be extremely addicting and even informative. And sometimes it can be just downright funny. Kids really do say the darnedest things. Impressing the ladies and your friends (but more importantly the ladies) can be rough sometimes. But there is nothing cooler than reaching into your fridge or makeshift bar and whipping up a delicious drink like it's nobody's business. 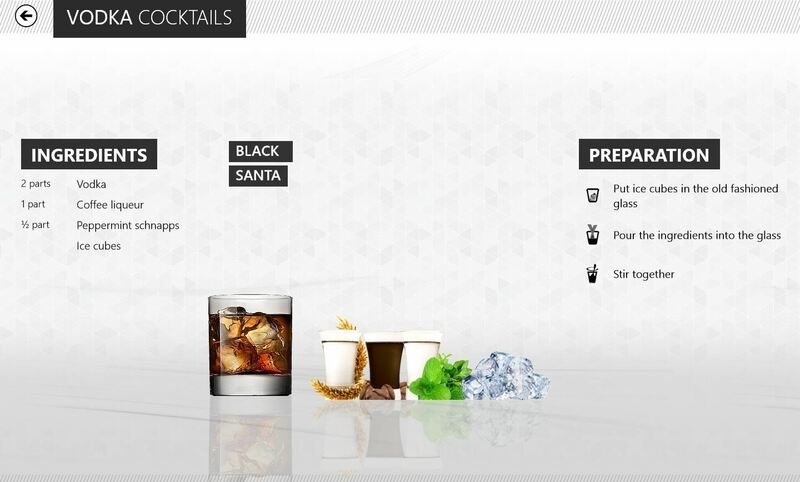 Cocktail Flow is a super sleek and super legit drink app that gives you the rundown on how to make great popular drinks. The application breaks it down by color, drink choice, and type, ranging from creamy to fruity. The app looks great and it's super simple to use. 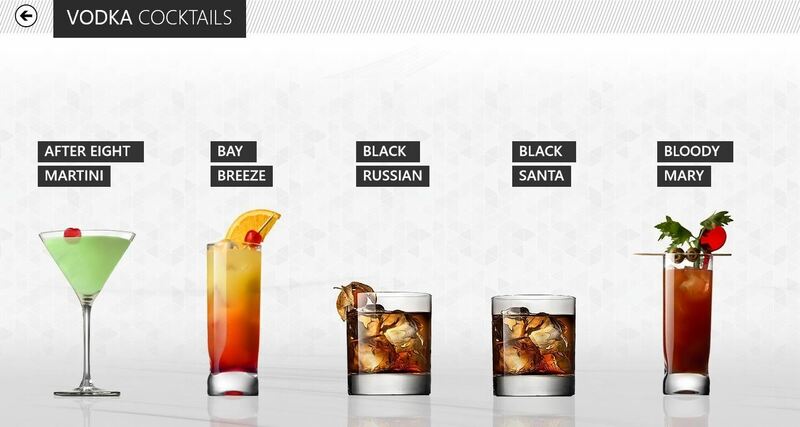 Simply click on your drink type and you will be given a few option to chose from. There are over 50 different cocktails to chose from just in the vodka section. Once you find one you like, click, read the instructions, and enjoy your pro-status creation. Everyone loves food, but sometimes finding out how to make something good to eat can take several phone calls to your grandma in Wisconsin. 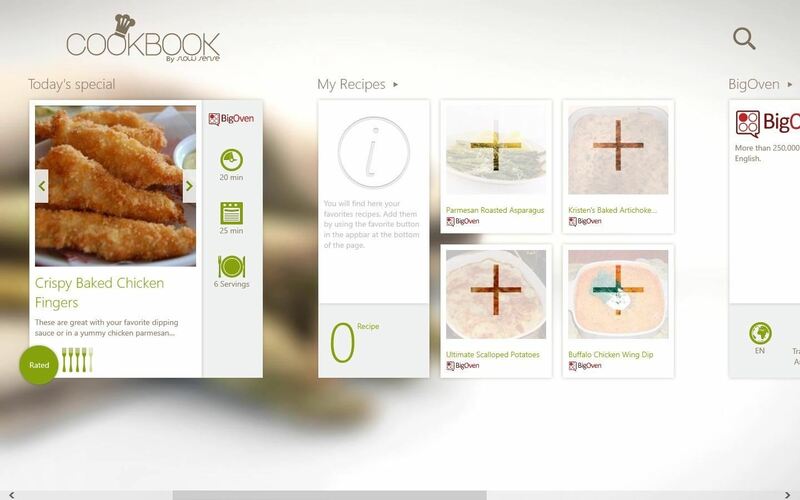 CookBook is another beautiful Windows app that gives users a bunch of different recipes with great images and even some user feedback. The app has daily featured recipes, and it's a great place to discover new meals and learn exactly how to cook them for you or your family. 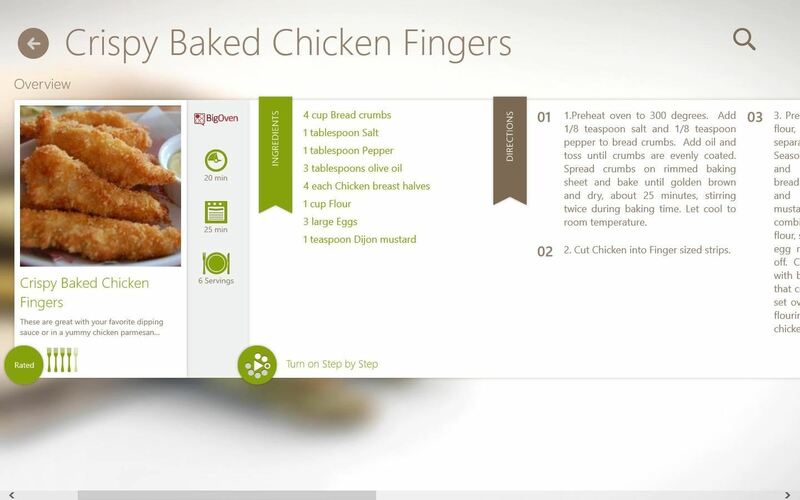 One of the coolest features is the step-by-step guide that you can use while you cook, and you can save recipes you like for later, so no more excuses about not knowing what to make for dinner! I love going to the movies more than a 3-hour gaming session of the original N64 Super Smash Bros, and that's saying a lot. Keeping up to date with the many movies coming out can be tough, and if you want to make sure you don't miss a premiere you've been waiting on for months, MovieGuide is a great source of information. 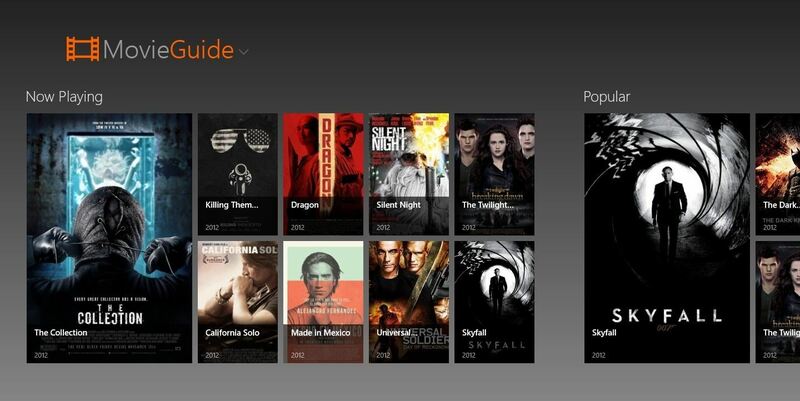 It has a section for the most popular movies in theaters right now, upcoming releases, and favorite movies of all time. When you click on a movie title you are interested in, MovieGuide does a great job of displaying all the pertinent information along with a bunch of photos and overall a very clean look. The only complaint I have is that there are no trailers available. For most people, that's the best part about waiting for an upcoming movie, and a key factor in deciding whether they want to see one that is already out. Nonetheless, it's a solid app for those looking to find out more on their favorite titles and characters. 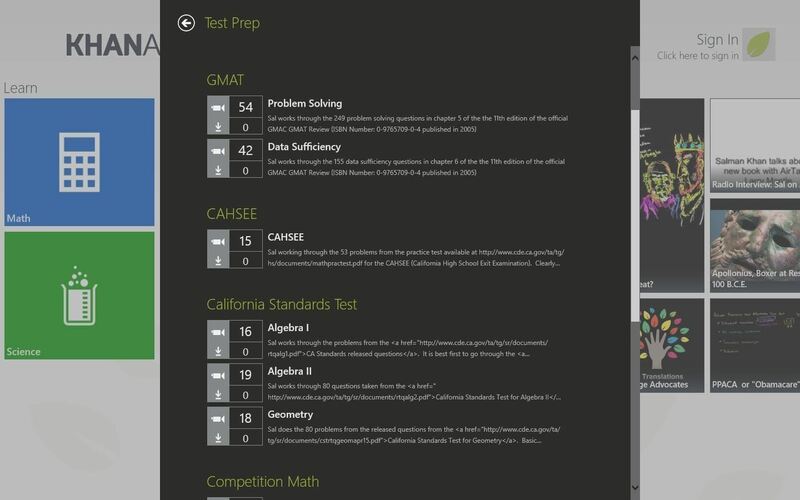 Do you know of any awesome discovery apps for Windows 8 that aren't on the list? Let us know in the comments below.